Submit your website to 4500+ directories, 50+ article directories and 200 feed sites! 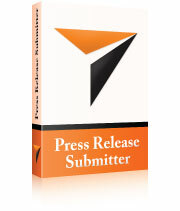 ◊ Press Release Submitter is the perfect tool for effectively promoting any kind of business. This application has the power of semi-automatically submitting your press release to over 14,000 media outlets (such as radio stations, television and cable networks, magazines and newspapers). ◊ You can use the Press Release Submitter as often as you want, whenever you want to reach countless media outlets with your news for press exposure. Our company has prepared a large media database of 14,000 contacts, including media contacts and press contact information used daily by professional press release services for their customers’ press release distribution campaigns. ◊ Launching a new website is an exciting thing for any business owner, but building enough exposure to become “visible” on the Web can be difficult. Press release campaigns can put companies of all sizes on a level playing field. Press releases are the best way to let people know about your business and products. You can use your media contacts every time you launch a new product/service or when you need to announce the latest news about your business. Press releases are the best option for helping you stand out from the crowd by leading to strong search engine placements, media coverage, and mentioned on blogs and e-zines read by your target audience. Press releases help you overcome the issue of competing with billions of other Web pages to drive new customers to your products and services, by showing that they deserve to be noticed. Step 1 - Add the press release. Step 2 - Select the desired categories. Step 3 - Send the press release directly to the selected contacts. ◊ Complete Control Over Distribution - Our Press Release Submitter application allows you to have complete control over the press release submission process. ◊ A Fast and Easy-to-Use Interface – Getting started with our website announcement application is simple, whether you’re new to press release distribution or are a seasoned pro. ◊ Customizable Media Lists – You have the ability to add your own media contacts to your media list, meaning you can be sure your distribution list is targeted to your news and you won’t simply be spamming irrelevant media outlets. ◊ Affordability - Pay once and benefit from maximum media exposure for as long as you want. Why pay monthly fees to a professional press release service when you can use our Press Release Submitter for a much more convenient price? ◊ Free Traffic - Our press release distribution solution will automatically drive traffic to your website once your press releases are submitted to targeted media contacts. Your website will be almost immediately picked by all major search engines. ◊ Access to Over 14,000 Targeted Media Contacts – If you don’t have the time to compile your own list of media contacts, we’ve done most of the work for you. You’ll have access to over 14,000 media contacts at your disposal before even lifting a finger! ◊ Exposure for Your Website - Our application can turn your new website launch into a nearly instant success. You can use our application to build a buzz surrounding your product/service, by using only targeted press contacts. Press releases are an excellent way to start building word-of-mouth. Never underestimate the value of press releases when it comes to online business. The first rule you have to remember is that by getting the attention of the press, you will increase your chances of becoming “visible” to countless prospective customers, which leads to business growth and increased sales. By using our press release broadcasting software you can automate your press release campaigns in order to optimize your media presence and attract new potential customers to your business. Watch a complete press release submission demo ! * The price does not include VAT. The license is valid 2 years after purchase date and subject to terms and conditions.